Last week was hot and rainy, but this weekend it turned into fall in a blink of the eye. Saturday we woke up to torrential rain showers and cold weather. I couldn’t believe soccer wasn’t canceled, but I guess so many games have been cancelled that we needed to fit one in. Players and spectators alike were soaked to the bone and freezing in a 45-degree downpour. It never let up and it took hot showers and tubs to get our body temp back to normal. It felt like soup outside. It didn’t seem like it was going to happen this year, but hot rain has turned into cold rain. We love soup and make summer soups all the time. 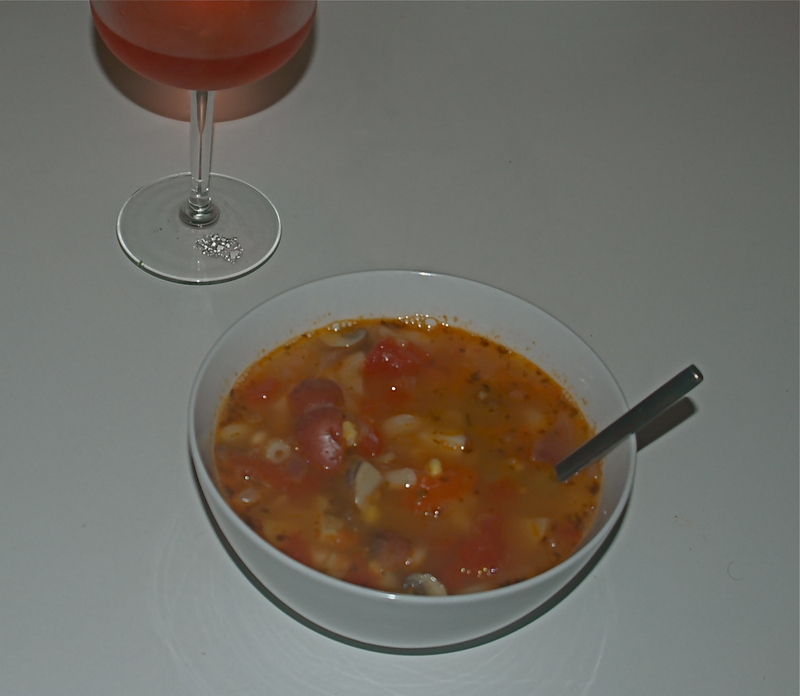 I didn’t have enough time this year to post the summer soup series, but I will do it as soon as the weather gets warmer. Hopefully it won’t be too soon. Since we make lots of different soups depending on what we have in the fridge and what Twin Springs has, even the fall soups are seasonal. We generally let the market decide what we make and this time of year is amazing since you get to have some of the summer stuff still hanging on and a preview of the fall veggies at the same time. This really is the most bountiful time of year for the local growing season. There are very few things we freeze or keep for out season use, but one of them is fresh local corn. Corn feels wintery to me for a number of reasons so when the season comes to a close we always buy a few dozen of what Maryland/Pennsylvania does better than anyone else. The white and bicolor corn this year was amazing and it has still been around for the last few weeks. To freeze we first shuck the corn and cut off the kernels. I have written this before, but it is really easy to lay the corn on a cutting board and work from tip to tail with a sharp knife. It isn’t hard to do, and we always fight for who gets to gnaw on the cob since the corn is so good it doesn’t even need to be cooked. We then put the corn in ziplock bags and freeze. Generally we use it for corn bread and corn muffins during the year. What is different about our last shucking is that we also use the cobs to make stock. I break them in half and put them in a large pot with water, salt and pepper. I have made other more traditional stocks, but the last two years, this has replaced almost all of them. It is so easy and so good that I have a hard time making anything that requires more work. You also get a great feeling that nothing is wasted. You just need to simmer for a few hours and you get the most amazing, rich golden stock you can imagine. You can drink it as is, but this is what we freeze and use all winter long in soups and risottos and whatever else needs a flavorful stock. Like most of what we do, it takes very little attention. 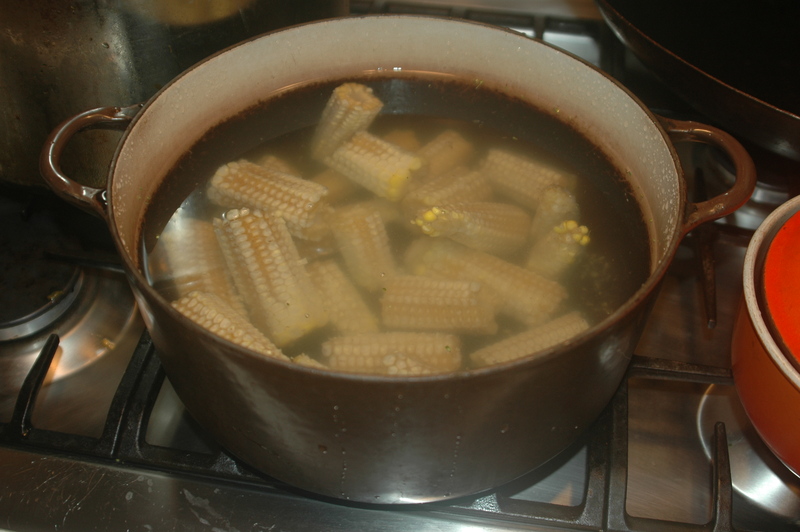 Even if you aren’t freezing the corn, you can save some cobs in the fridge during the course of a week’s use of corn and make a stock with the gathered cobs. I made two different batches with about 24 cobs this year so the freezer is full. Since I couldn’t fit anymore in the freezer, we made a soup from what was left in the pot and some of the other great fresh veggies. We usually decide between rice and pasta as a starch addition to most of our soups. Some times we have soup as a starter, but we often times make it a meal unto itself. We always make sure that we have a protein packed into the bowl. Depending on the soup and what veggies we’ve included, we often make a salad to go with it which is always a nice cool contrast to a hot bowl. For today, time ran out. 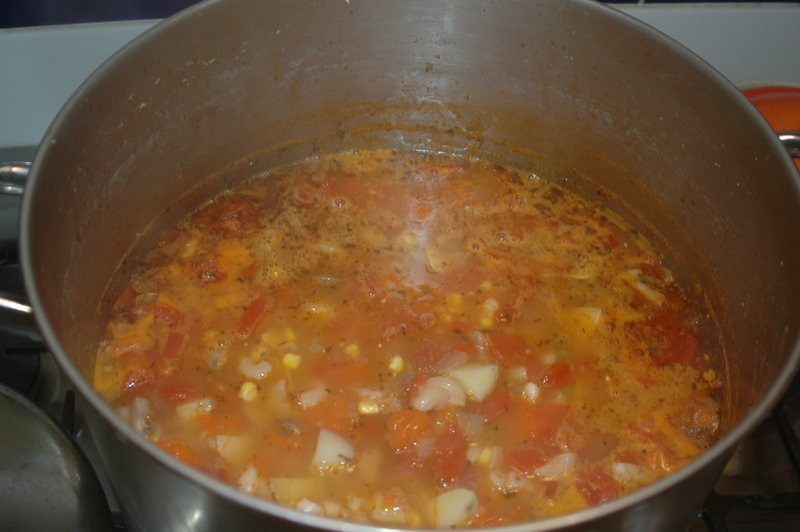 We needed to do it all at once so we took advantage of having local tomatoes, local onions, and local potatoes all from Twin Springs (and our corn stock with some fresh corn). Since the stock was so plentiful I had to take out some white beans that I cooked and froze a few weeks before. I always like to have beans ready to go so we can add to a soup or make a sauce without having to start the soaking process from scratch each time. This gave the soup not only a great Tuscon twist, but added the needed protein for a complete meal. Twin Springs also had some fresh sage and thyme so they went into the pot as well. I added a little bit of olive oil and some baby Portobello mushrooms that the kids love to pick up when we go to the organic grocery store for our staples. When the veggies were almost done, we added some potato, brown rice and soy macaronis. I like to cook the pasta in the soup since the starch from the pasta water makes soup naturally thick. We each had multiple bowls and felt full and warm from the steaming broth and the addition of our house made hot sauce that goes on everything. We also had a glass or two of Rose to cool off our mouths. I can’t believe how versatile dry Rose’s are with food. This one was a fantastic bottle from Provence with bright flavors and perfect acidity for the warm bowl. By the end of the meal we all had to mop our brows and take off some layers. The soup did the trick and we were warm and full. The suburbs of DC are not really thought of as an agricultural Mecca. Big chain grocery stores pretty much sustain most of the population. It is made up of sprawling communities that slowly, but surely seem to be on a campaign to leave no tree standing. Since I have lived here on and off most of my life, I have witnessed the destruction of old oak forests and lush meadows. Large farms with fields of soybeans and corn were everywhere. Unfortunately, these crops were all too quickly replaced with new McMansions. I find myself telling my kids, and sounding like my grandfather, about the way it used to be. Cornfields we would hang out it in, horse pastures we would walk through, and many places where we made typical high school mischief. With that being said, we are really lucky to have a growth in farmers markets and groceries that supply more interesting produce than when we were surrounded by farmland. Much of it is local and organic. We also have some woods adjacent to our house that provide the most local bounty available. 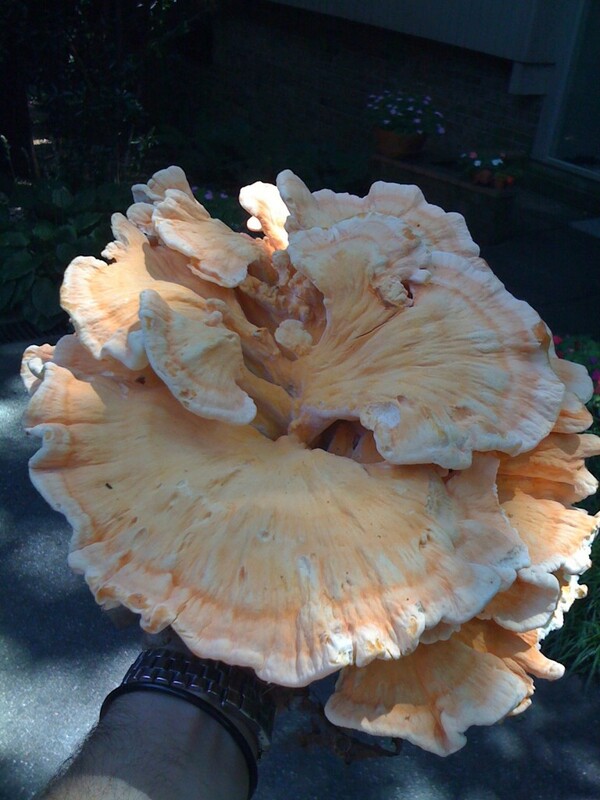 We are really lucky to have a great source of edible fungus literally in our back yard. After a few years of finding and eating wild mushrooms, you get a feeling of when the time is perfect for hunting them. There is nothing like looking into the woods and seeing a little glimmer of bright orange and knowing you have spotted a mushroom. It is the thrill of hunting without having to kill an animal. Last week I was really excited to have found the first mushroom of the season. 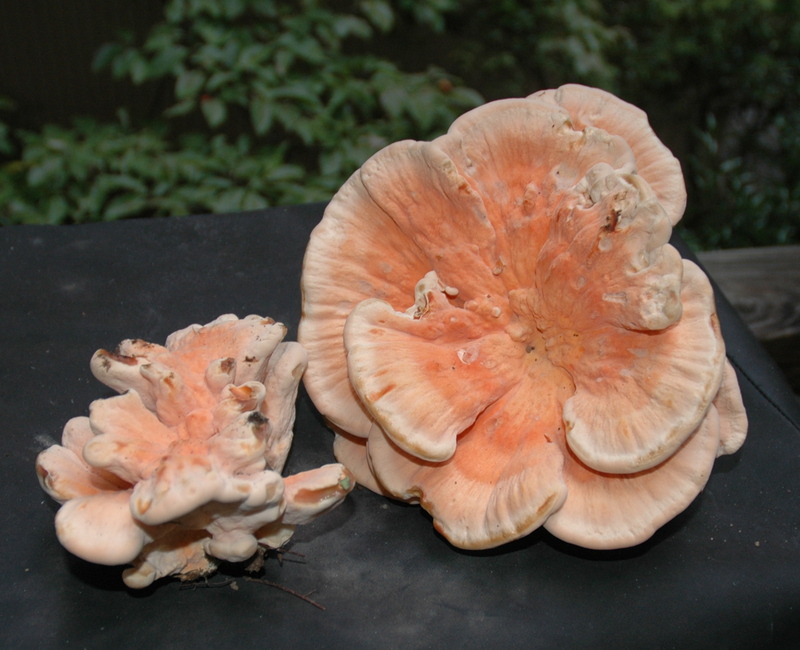 It was a large Chicken of the Woods and must have weighed twenty pounds. It was perfectly ripe. Generally, when we find a mushroom, it is usually more than we can eat. My first call is usually to my sister who appreciates the gift and also finds them near her home in Downtown DC. I have a list of people who I know will help eat and appreciate the find since there is nothing worse than harvesting and wasting a perfect mushroom. If it is big we have been know to have them at breakfast, lunch and dinner for a week until we can eat no more. This last mushroom find happened to coincide with market day so I was really happy to have been able to share our catch with Jeremiah and Maura from the market. They are food lovers and I knew that they wouldn’t let them go to waste. I am not a Mycologist, but I am comfortable with finding and eating a few types of mushrooms. When we had the restaurant, we would often buy mushrooms from a local hunter and when I would find some myself, I would verify them with him before eating and serving them. I now am very comfortable with what we find and have no problem serving them to my kids. If there is even the slightest question of what type of mushroom we have found, we leave it in the ground. We have the classic Babar series and my kids are very familiar with the consequences of eating a poisonous mushroom. The saying goes, “there are old mushroom hunters and there are bold mushroom hunters, but there aren’t any old, bold mushroom hunters.” Virginia actually isn’t a real mushroom fan, but there are some that she likes when they are cooked in a certain way. Her fear of death is waning, but unless they are crispy, she isn’t a fan. It is a texture thing and is the reason she isn’t a huge fan of eggplant as well. 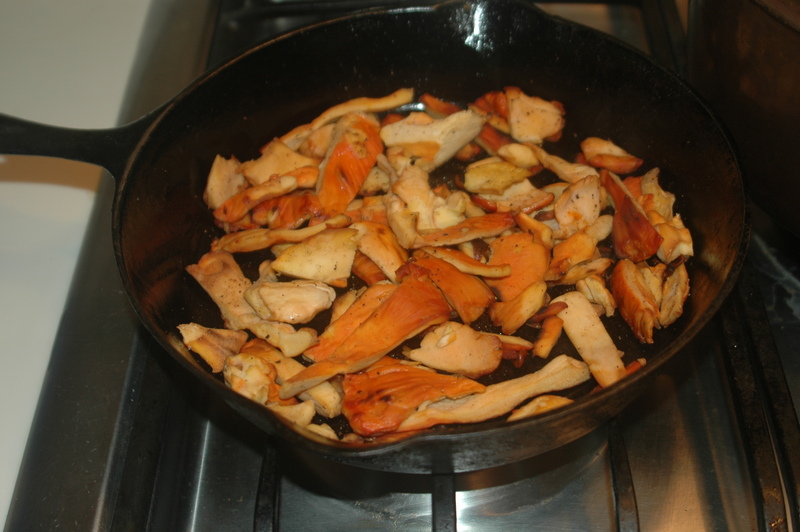 For the most part we don’t really incorporate Chicken of the Woods into a dish as much as we have it as a side or a separately cooked part of a meal. They are substantial and as I have been told countless times, can be a chicken substitute. We cook them in the style of what we are eating. For the most part we grill or roast them. We cut them into smaller strips and them with grape seed oil until lightly coated and add whatever seasoning lends itself to the meal. If we are grilling other things, then they are done on the grill. I know they are safe to eat, but since critters also like them in the woods I feel better about making sure they are cooked for a long time at a sustained temp. They remain juicy even when crisp, but I make sure they are cooked for at least ten minutes at a super high temp. On the stove I usually season with salt and pepper and add garlic and onions. For the first five minutes I cover the pan to make sure they are cooked inside and out and then take the lid off to crisp them. You can do the same in the oven under the broiler. I set the oven at 500 and keep them in the middle so they don’t burn, but get mega heat. They are very hearty and I think, like chicken, they really take on many different personalities depending on how they are seasoned. They do have a unique earthy quality that always shines through, but they are really versatile. You can also have any wine you want with them. This week we had them with sparkling rose, white Burgundy and a deep dark Corrbiers. This time our chicken of the woods lasted for many meals. They went into tacos; were cooked with soy and miso and then drizzled with sesame oil for a side with Asian black bean noodles; and done with fresh time and oregano with olive oil over a pasta dish with diced tomatoes. Sometimes if they don’t really go with what we are cooking, I crisp them and serve as an appetizer while we are all cooking. They are the worlds greatest French Fries. I started writing this and have since found another young and tender Chicken of the woods in the back. Good eating tonight and for the rest of the week. 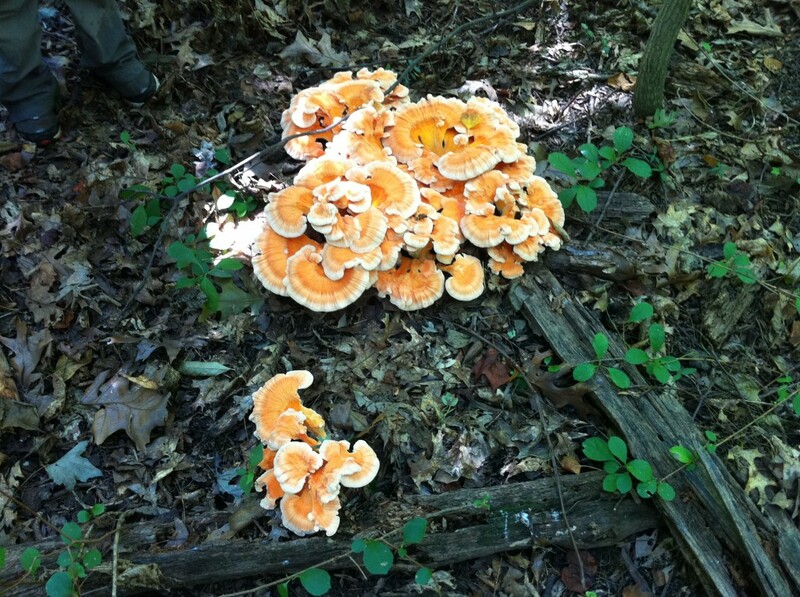 We look forward to finding oyster mushrooms and puffballs, which are just around the corner. I don’t remember ever having such a hectic summer. Never have I felt so relieved that school was starting. While we didn’t really travel until the last week of summer break, the level of activity (camps, soccer, swim team, piano, etc.) and coordination of all these events was insane. We knew we were over scheduled at the outset, but we would not have passed up any of these opportunities for the boys to grow and have fun. I want to come back as one of them in my next life. 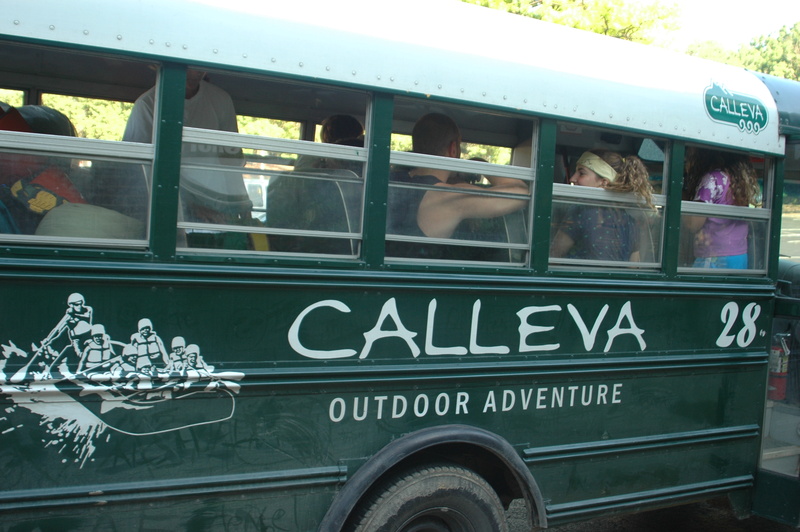 They just needed to wake up in the morning and then they were ushered to a day of fun and adventure. For the first time this year, the boys go to the same school at the same time and ride the same bus. It is both awesome and sad since it also marks a new phase in life that is a real departure from babydom. 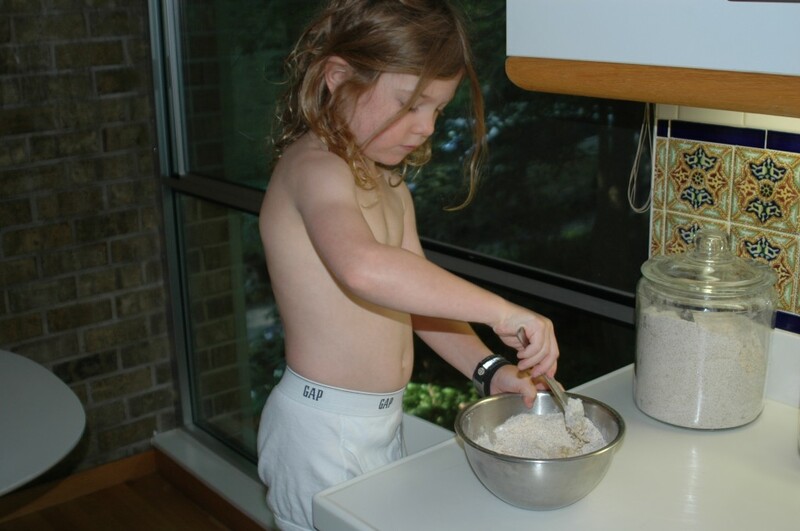 Since Noah first started eating, I have always made bread. I think I have talked about this before in another post, but it seems fitting to address it here because it is so tied into our school lunches. Even though I made bread all summer for camp, baking bread for school feels different for some reason. Since we are vegans, fresh bread seems like the least we can do to make sure the kids have the best sandwiches possible. We always have two different types of bread dough in the fridge at all times. Since Virginia is gluten free, I also need to have bread for her as well. My grandmother always made bread. I have a very distinct image of her shaping, rolling and kneading dough. There really isn’t another smell that comes close to freshly baked bread. My mom baked, but was more of a cook than a baker. It wasn’t until we had the restaurant that my bread skills took form. My sister is an awesome baker and quickly developed multiple bread recipes. We had three different breads coming out of the oven all night long so everyone had fresh bread. Most people think making bread is hard and are often intimidated to try it, but it isn’t that hard and it is really fun to do. I also remember this French guy who my sister met one summer who came to the house and baked all these breads from scratch without any recipe, and I thought that having this ability would serve me well in the pursuit of good bread and hungry women. Cooking in general, as a man, has some serious benefits when dating. Think the “man’s heart through his stomach” works even better with switching genders in my experience. So everyday my kids have sandwiches on freshly baked bread. Usually the night before school, we pull some dough from the fridge and bake a loaf. It is takes about 50 minutes to shape and cook and then a few hours to cool. The process from the beginning is a little more involved, but I only do it once a week and like everything else I cook, it can be done through out the day depending on time. The good news is, I have found it really hard to totally screw up the starter, regardless of how much I neglect it or rush it. 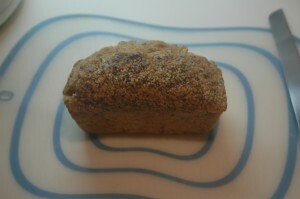 To start the process I make both the gluten free and the wheat bread at the same time. The starting process is the same for both and includes many of the same ingredients. Since I do make a bit of mess, it is easier to make only one mess on one day. 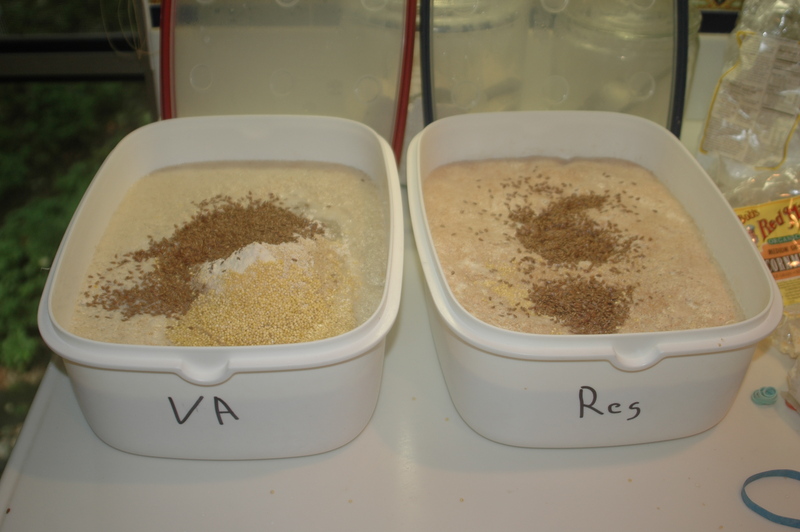 I start out with fresh French yeast that I get from a distributor I used at the restaurant. 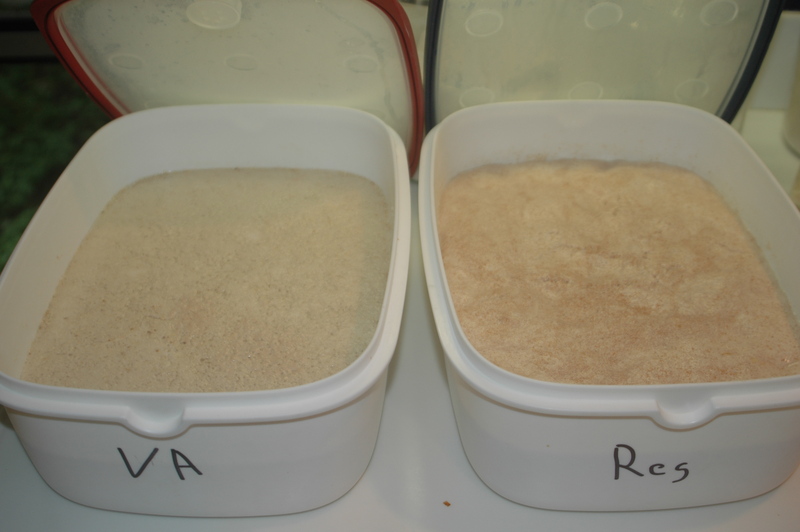 You can use dry yeast or even fresh yeast from the grocery store if available. The French yeast is my favorite. I keep it in the freezer and a brick lasts me about two months. The first process involves activating the yeast. I combine a small fist size of fresh yeast with warm water, a couple of table spoons of sugar, a healthy scoop of flour (whole wheat for the normal and brown rice for the gluten free bread) and mix by hand until everything is roughly combined. You probably don’t have to mix as much as I do, but I love the feel of squishing it through my hands (and so do my kids). You can now leave this alone. It will start activating within about 5 minutes, but you can leave it set out all day if you don’t get back to it. If you have the time and can watch it for a few seconds, you will see bubbles rising to the surface slowly. If you see just one, you know it is working. It doesn’t always work so checking is important before you jump ahead and waste a ton of ingredients. I like to wait for a lot of action, but it shouldn’t be too much more than ten minutes. 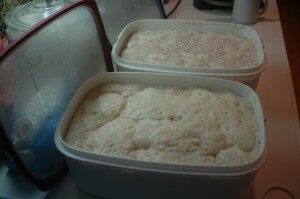 Once the yeast is active it is ready for the second rise. This is where the real fun starts. Most the flours I use are predominately whole grain. For the non-gluten free bread, I add whole wheat, oat bran, whole millet, whole flax seeds, wheat germ and any other flour I have around. I also add about 1/5 unbleached white flour. This is essential for the bread to stay together especially for the sandwich loafs and pizza crusts. You can use the dough for anything. 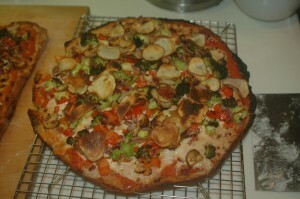 I have made pizza, baguettes, flat breads, sandwich loafs, bagels and twisted soft pretzels from the mix. The consistency at this stage has to be loose mud. This time you want to combine all the stuff well without over mixing. Get the clumps out. For the gluten free bread I add medium grind corn flour, potato starch, more brown rice, oat bran, whole millet and whole flax seed. I keep this super wet, as we tend only to make flat bread from this dough. For both doughs, we let them sit for about 30 minutes. If you are in a rush, you can proof them in a warm oven to speed up the process. Or if you need to take an hour or so, you can keep them in a cool environment. You need to play with the process your first few times until you get a feel for it. One thing to note is that the bread will double in size. Mark your container so you can see where you begin and when it explodes. After it magically grows you are nearly done and ready for baking or storage. First you need to add salt. Not only does it add to the taste, but it also helps slow down the out of control yeast explosions that can happen if you’re not careful. For both breads, I also add more flours. For the gluten free, I get the consistency to a yogurt- like state where it can be easily spread on a stone without running off the edges, but not thick enough to hold shape. For the regular bread, I add more white unbleached flour with the salt. You can add more flour at anytime, but you can’t add any more moisture. Eror on the side of wetness. To make a loaf, I coat a bread pan with spray oil. I use grapeseed oil since it doesn’t have a taste and doesn’t burn, but you could use any spray or oil as long as you coat the pan. 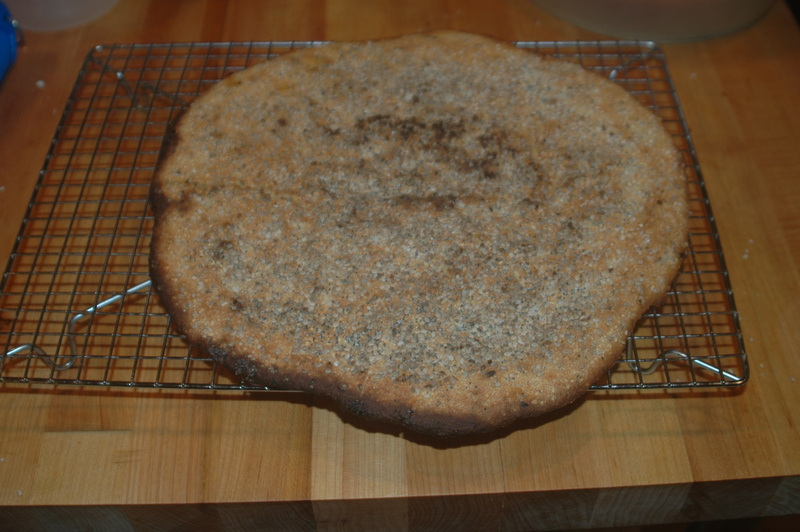 I then fill it up half way and coat the top with sesame seeds, poppy seeds and coarse salt (pat it down a bit so it makes a nice coating on the top). I bake at 350 for about 45 minutes if the dough is room temp or 55 minutes if it is cold from the fridge. The remainder goes into a container with about half the space remaining since it will still rise in the fridge. 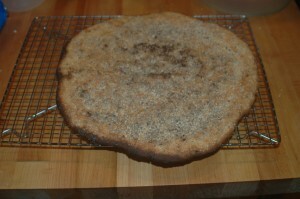 The gluten free bread is spread out on an oiled stone and topped with the same seeds and salt, but baked at 500 for about 10 minutes and then I take it off the stone and put it directly on the rack. Virginia likes her bread crispy. There is really nothing like it fresh out of the oven. We can do her bread in about 15 minutes and the kids devour it with tofu cream cheese or soy butter or almond butter depending on what they have a taste for. Her bread always seems to go first. 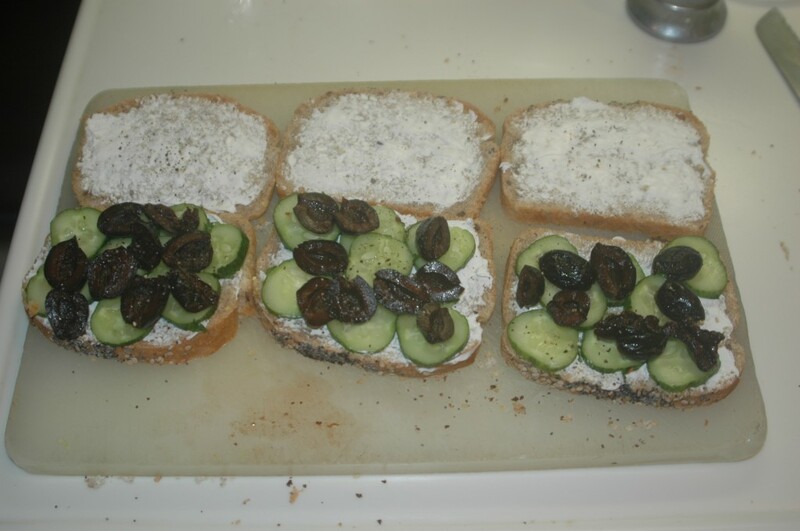 I will delve more into lunches this week, and our favorite sandwiches for school. After OC, we headed up to LA for a few days on the beach and no cooking. We got in early to see some friends. Since we couldn’t check in, we met at our favorite LA spot, the Santa Monica farmer’s market. We have a tradition of making sure we are in LA for a Sunday so we can go. Our good friend Adam usually bikes over to meet us for lunch after his basketball game, but we were there very early and planned to catch up with him after. I felt back at home surrounded by people of all different walks of life. Not only does the market have amazing local stuff that probably comes from where we were, but it has awesome food as well. We were no longer freaks of nature and the options for vegan gluten free are tremendous. Vegan tamales, burritos, raw vegan shakes, baked goods and fresh coconut water in a coconut were only some the things available for us to eat. We were stuffed and content to visit with friends, listen to live music and watch a completely different scenery. Finally we got into the hotel and back to the beach without an agenda. Our kids are so happy to run on the waters edge, burry themselves in the sand and look for shells. We could just sit and read and listen to the ocean and imagine a sea full of whales and dolphins just in front of us. I didn’t need to do anything else until it was time to eat. Dinner on our first night was at AXE in Venice. 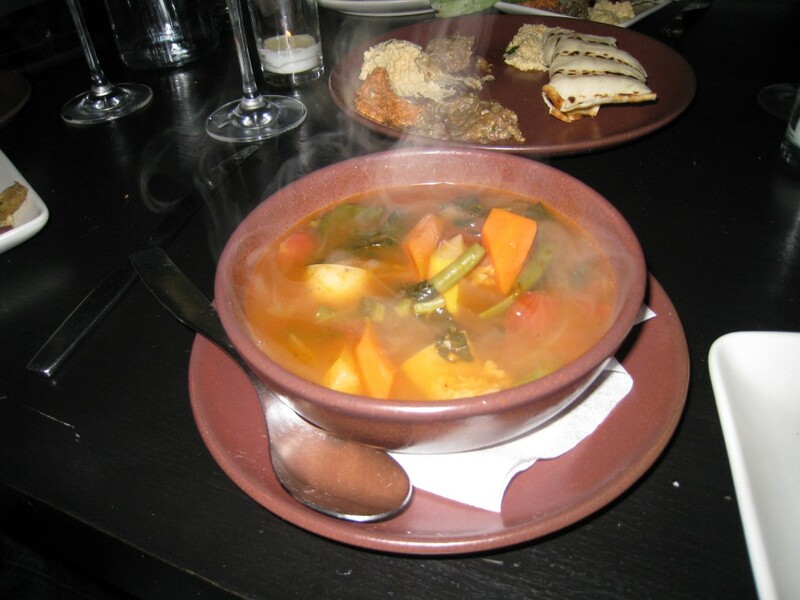 We have had some good meals there and it is very casual and welcomes vegan eaters. Last time in LA it burnt down to the ground on the night we had reservations. It just opened up for the first time a few days before our arrival. We walked down Abbott Kinney to pick up Adam at the Other Room, his local hangout, which has an awesome glass front and big scene on Sunday nights. It seems more like a European Sunday evening out than anywhere I have ever been in the US. I went in to fetch Adam as the kids talked to everyone in the window seats and played with countless dogs that also came out to socialize. Knowing it would be hard to get Adam away from his friends, I went in solo to get him. He came out surprisingly quickly with some friends to meet the family. Never have I seen a person more suited to a place. Adam is Venice and it makes our time there more interesting than it would be without him. Finally at AXE, with starving kids and a little late for our reservation we were able to order. The space was similar, but even nicer than it had been with a great outside patio. We had a very good meal and enjoyed dinner and talked to other patrons and staff as Adam knows everyone. 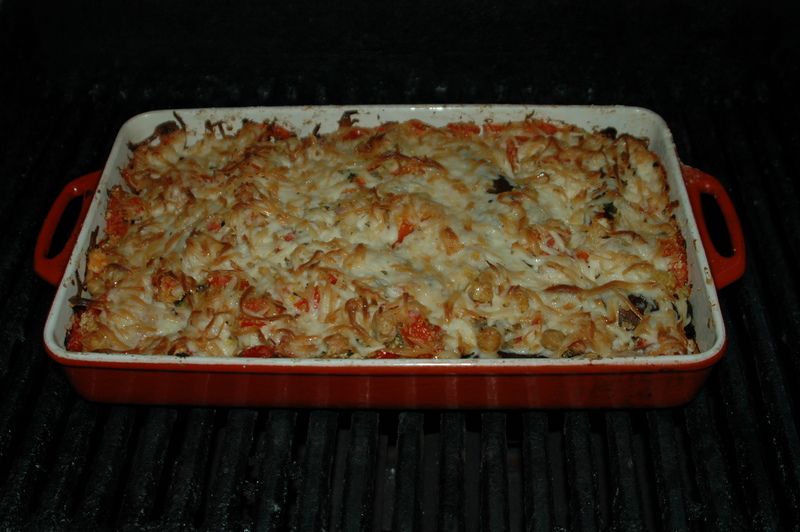 A veggie Pistou was the highlight of the meal. We ordered everything we could and chowed. We then strolled the streets of Venice meeting and talking to what seemed like everyone who went by as we made our way to Adam’s house to see Hannah and Nina and their new friends. 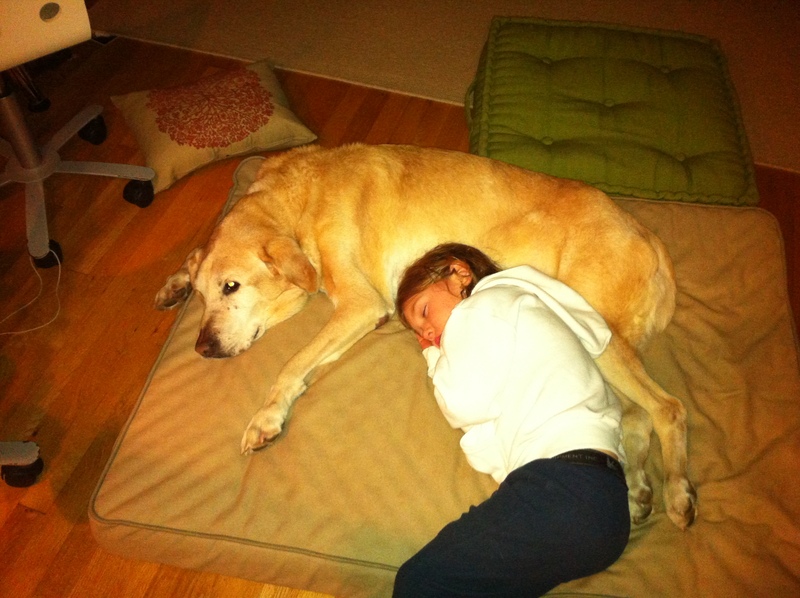 Dogs are a big part of our life and since Samantha can’t travel with us we need our fix. 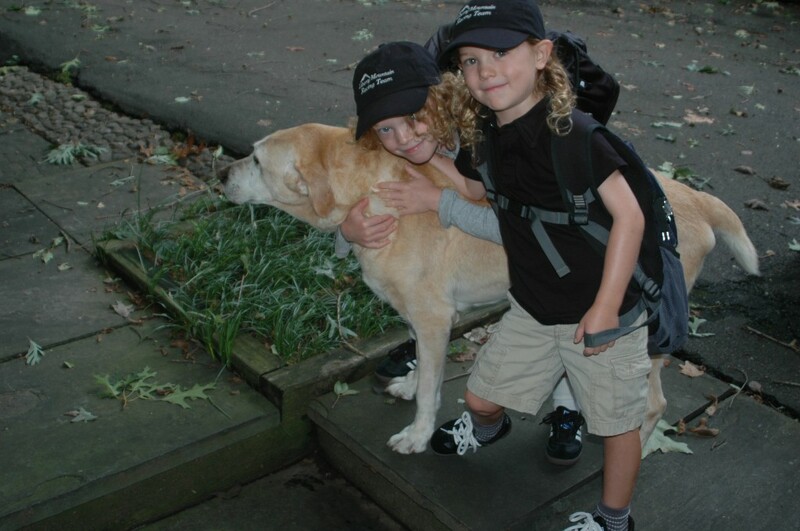 The kids have been coming to CA all their lives and have a relationship with the local animals and the people. This year the special treat was a rabbit and cat that was on temporary loan to Dennis, Adam’s next door neighbor. At this point it was super late so after the visit with the animals, VA went back to the hotel with the kids and I stayed out to experience what is every night for our single friend Adam. I rarely make it out late, but I had a great night meeting beautiful and interesting folks of Venice. Breakfast in Santa Monica/Venice always take us to Urth Café. Another great spot for Vegans and lots of choices for breakfast and lunch items all day long. While I don’t have a regular job, it is still hard to believe that a Monday in this area is no different from a Saturday. I know people work hard, but not the same way. You can’t help wonder what the hell everyone does for a living. 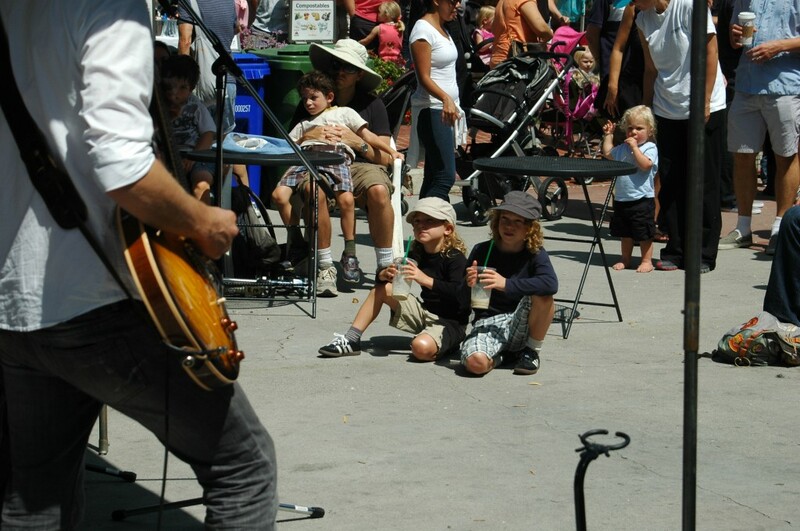 They seem to linger over coffee all day long. This place is packed constantly. If you ever watch Entourage you have seen a glimpse of the scene. The food is good and the kids have their favorites. We always sit on the back patio and eat a variety of things. The coffee at Urth is awesome and Virginia always gets one of the “best damn soy lattes” I have ever seen. More beach to follow and then a planned dinner at Vardo. We had never eaten dinner there before, but last time we were in LA we went for deserts since it is a vegan place. We had a great experience last time as Noah was sitting next to Jessica someone who was dating Justin someone. I had know idea who she was, but she was very talkative with Noah and we all figured out our common veganism. Her group was raving about their dinner so we vowed to try it next time out. Virginia couldn’t believe how much she looked like Jessica Biel and was dying to say just so, but for once held her tongue. Adam confirm who she was after we left. I was happy I didn’t know until after since we had a nice conversation and I would have felt like I was intruding if I had know her star power. She was easy on the eyes. Anyway, the food was good. It is rare that we go to vegan places, and it is novel to be able to order anything on the menu without having to give the staff the third degree about hidden non-vegan or gluten items. Sorry for the hiatus and the long report to follow, but we were visiting family. Virginia is from California and we often go back to visit. I have to admit I am a much bigger fan of Northern California since I lived in the Bay area for a short time as a kid. San Francisco and the East Bay are some of my favorite places to visit. Usually, we combine North and South in one trip, but we didn’t take the time this year. 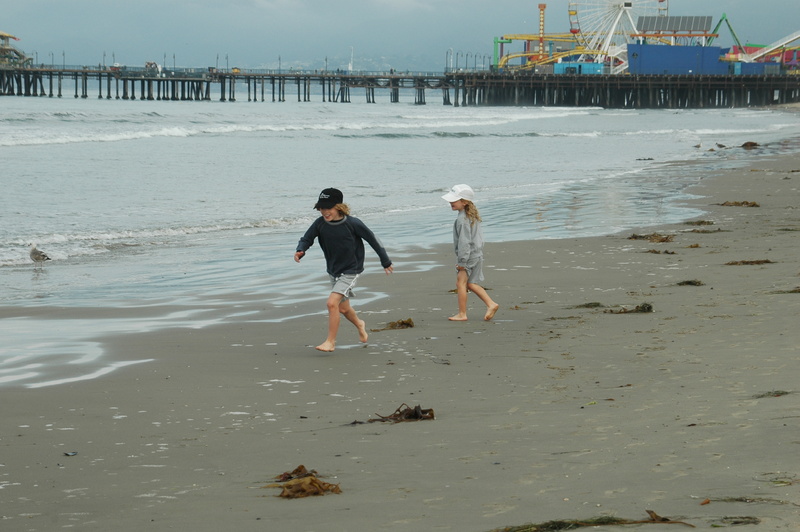 Our usual Southern itinerary is Orange County to see family followed by a few days in LA so we can eat, relax, hang with friends and have beach time. We are generally not beach people. 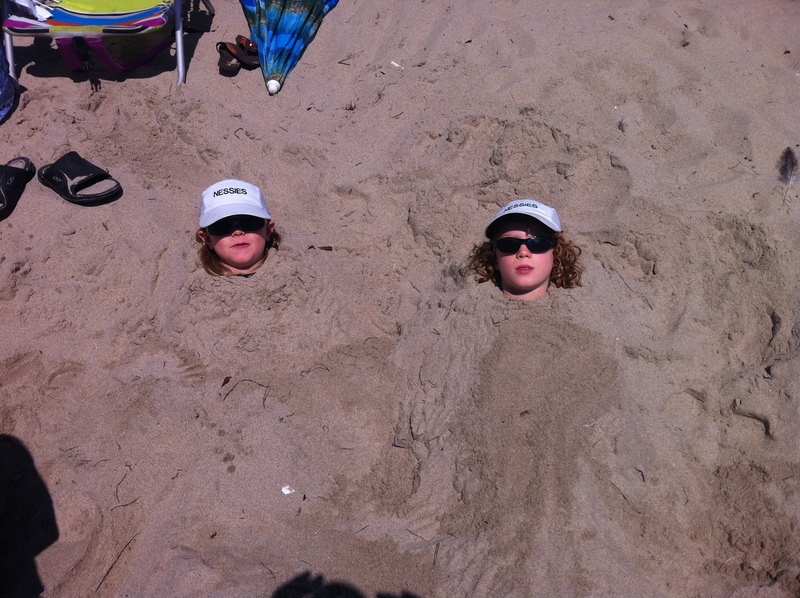 But when we visit the family in the west, we always try to spend a few days at the beach. Orange County is an interesting place. It is very cool for me to see mountains when I look to the east. I love mountains and while I prefer to ski on them and hike in them, just seeing them is comforting. It is actually essential since I have to admit I am not a huge fan overall of SoCal. Virginia left as soon as she could and I know why. I love visiting the family, but apart from that, I can’t say the OC is for me. Since food is so insanely important to us, I get nervous about what we are going to eat on our visits. We do have some favorite Mexican joints, and try to hit them as frequently as possible while visiting. It is really the best they got. 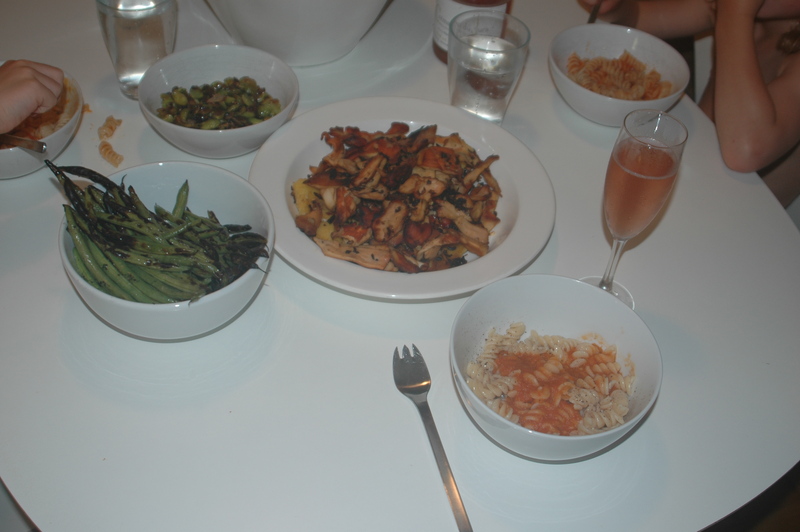 We also cook a lot when with family, and generally I always ended up cooking because it is just easier. With our diet it is hard to fit into the family barbeque unless we really participate in the cooking. It is safe to say that vegan and gluten free eating is not what the rest of my wife’s family does from day to day. Fortunately I love to cook and it gives me something to do since there isn’t a whole lot else to do. Orange County reminds me a bit of where Elliot in ET lived (although a whole lot less interesting without the alien to spice things up). I need to say again that I love my wife’s family and they are all very fun, warm and welcoming people who have been gracious to take a freak like me into their lives with open arms, but we all live where we live for a reason. When my wife was a kid the OC actually had orange groves. You can still see the agriculture in the areas that haven’t been turned into planned communities that all look exactly the same, but I have always been hard pressed to find the local stuff. Every grocery store has some sad looking produce that is essentially the exact same as the stuff we have here on the east in our grocery stores. I was looking for local stuff to make for dinner at the grocer down the street and couldn’t buy the Peruvian asparagus or Chinese garlic. It is America’s largest agricultural state for goodness sake and the shelves were lined with imports or just your basic run of the mill stuff. While shopping I was sad to miss the end of the summer season at home. No fresh corn or tomatoes, no local arugula or lettuces, or really anything with local flavor. We made two big family meals for about 18 people each. The first was a fajita night and the second was an Italian night. Usually I do the cooking myself, but there is a new addition to the family who is a food professional as well and we had a really good time in kitchen together. Bob made a wonderful pico de gallo and we collaborated on a great guacamole. Sadly I don’t have many pictures of the food since I was very busy cooking. Bob made chicken for the fajitas and it looked great. I made brown rice and black beans along with veggies for fajitas on the grill. 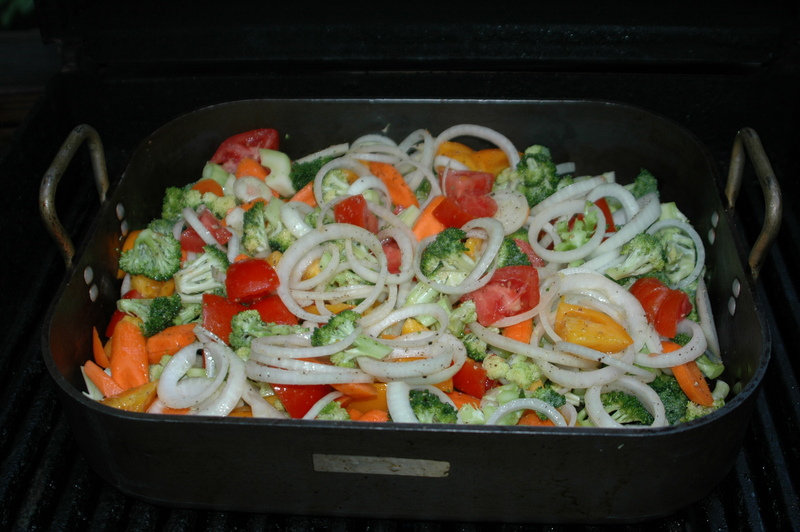 I used broccoli, onions and carrots since that was really all I could find in the local grocery. Spiced with ground chilies and fresh jalapenos, salt and pepper we had a full meal that everyone enjoyed. These guys couldn’t believe the amount of food I made. My biggest fear in life is not having enough food for everyone. It made a great breakfast and lunch later and great leftovers for the rest of the family. Italian night was fantastic. Some of the family has simple tastes and serious dislikes. Virginia’s brother never met a veggie he could eat. Red sauce is ok, but there can’t be an identifiable vegetable on the plate. I made a tomato sauce and combined some ripe roma tomatoes with some Italian crushed tomatoes from cans. Don’t tell Gary, but it had onions and garlic in it. Bob made an amazing bruschetta that was the biggest hit of the night and he made some without parmesan for us and VA even had some on gluten free crackers. I made enough penne to feed the hood and added the red sauce to make sure the bits of veggies were hidden. 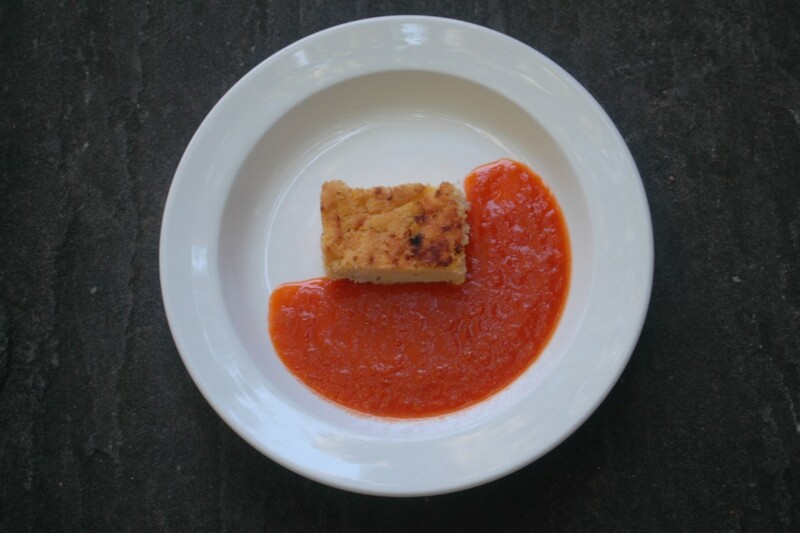 For Virginia I made a simple polenta cake since we couldn’t find any gluten free pasta. Virginia made a romaine salad with cucumbers. We needed another veggie so we went back to the broccoli and put it on the grill. Not a bad meal and a great reminder that even with a limited kitchen and limited grocery you can still make great meals for little money and effort. 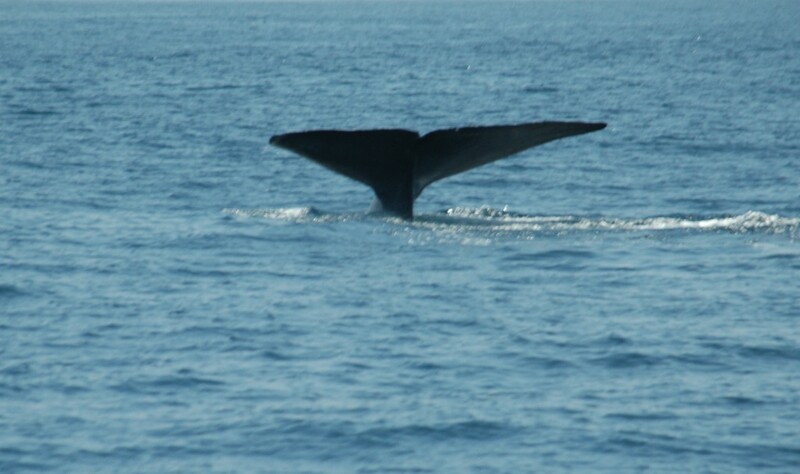 The highlight of the OC trip for me was a scheduled whale watching event. 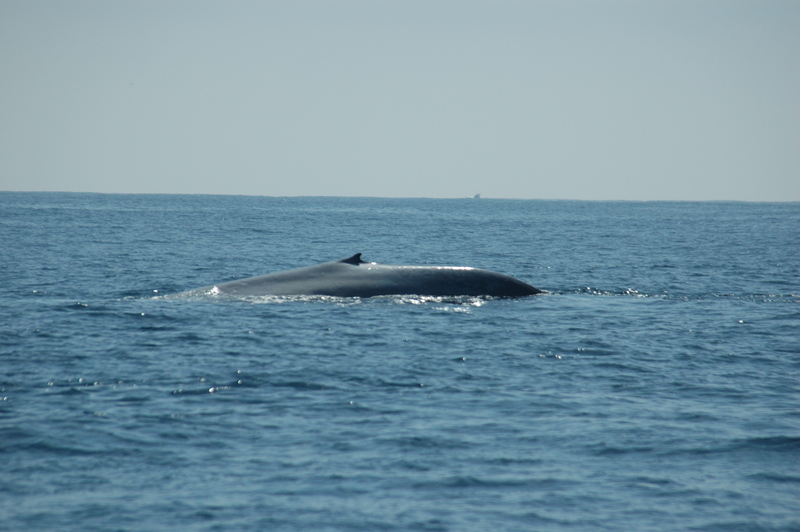 We took a very small catamaran from Dana Point and traveled four miles out to find a whale. We saw hundreds of amazing dolphins and finally one large blue whale. This beauty was impressive and well worth the trip. 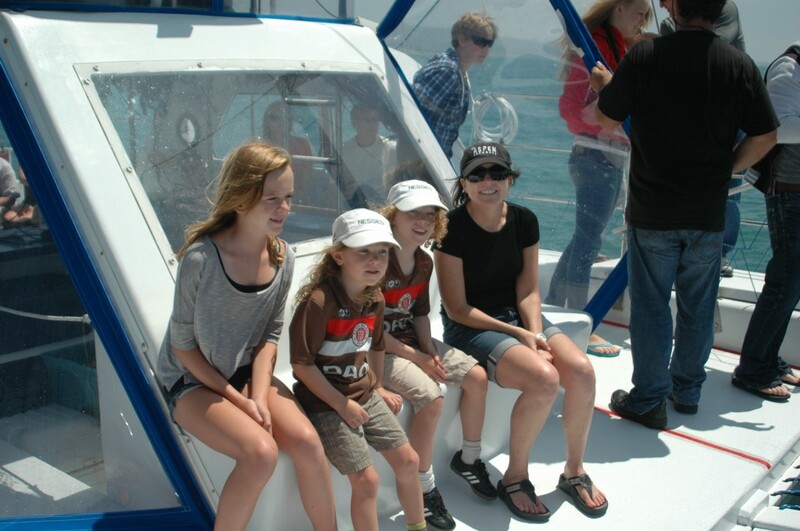 All the kids had a blast as well and we have been dreaming and talking about whales ever since. Being on the ocean and feeling very small was a great contrast to OC living. Anyone who goes out for visit and needs an escape should look up Capt. Dave in Dana Point. Noah’s Bday fell on a Monday this year. As I have written about before, we take our food seriously on birthdays. The celebrator gets to pick a home dinner and a night out meal at the restaurant of his or her choice. Noah wanted to see a professional soccer game for his birthday. I personally am not much of a sport spectator. I love sports. I love to play sports and as a family we spend most of our leisure time participating in one sport or another, but I generally don’t like going to stadiums. Going to any professional game takes so much time. That being said we had a blast at the DC United professional soccer game. It was super easy to get to the stadium, park and watch great soccer at the classic RFK. On top of that, it was pouring rain which none of us seemed to mind. Being totally drenched and too full from dinner couldn’t stop our fun. I could see myself going to another game. We started the evening off with a pregame dinner at Restaurant Burma, Noah’s choice for his “out” meal. I have talked about Burma before, and it continues to be the one place we absolutely crave going to. 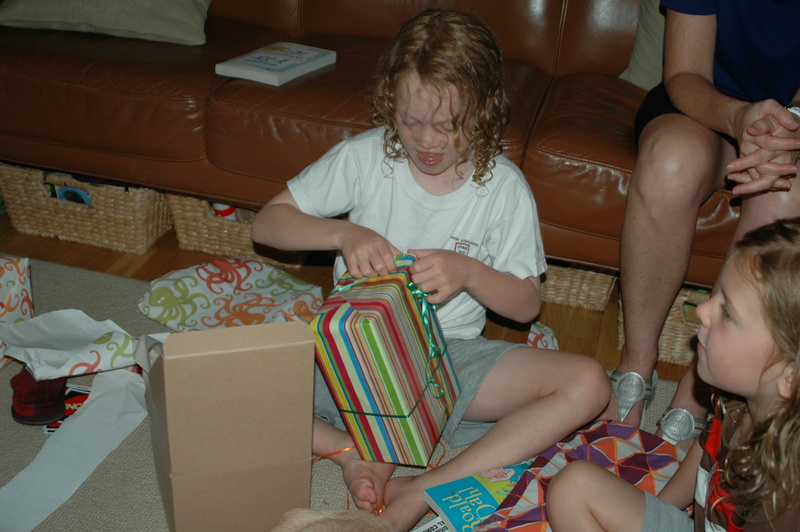 It is generally the choice for Birthday dinners for everyone in the family. The hard part about Burma is eating light. Don’t get me wrong. The food is very light, but we order way too much and have to every time. There isn’t a single dish we could do with out and look forward to mixing all the flavors. Green Tea Salad, Green Papaya Salad, Ginger Salad, Tofu Sour Mustard Greens, Tofu Tomato, Bean Thread Noodle, Potato Puree and Okra Salad are our mainstays. There are other vegan dishes, but we always have to order all of these. John and his mother who own and operate Burma are always so nice to us and we look forward to seeing them when we come in. On Noah’s actual birthday on Monday he had birthday pancakes, went to camp Calleva, and we had his birthday dinner at home. His choice this year was Pad Thai. Some form of this dish is on the rotation often. 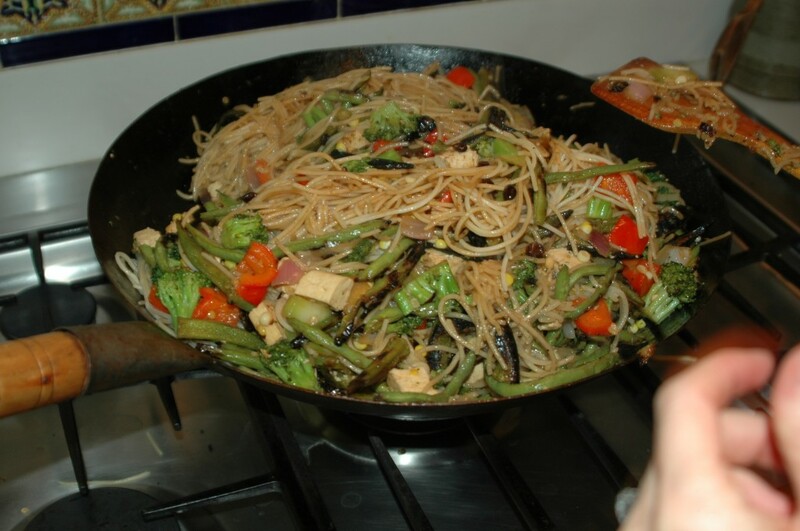 It is relatively quick and we all love Asian food for the most part. Sasha has decided that he isn’t a fan of our version of Pad Thai. The other night I made Singapore Noodles. It was a little different as it always is since we never use recipes, but for the most part it was Pad Thai with a slightly different sauce. Halfway through dinner he asked why it wasn’t called Pad Thai. I admitted it was basically the same but I had made the sauce differently and he was ok with the answer, but at five he is way too smart to deceive and that isn’t what I would ever want to do. Tonight’s Pad Thai had some newer ingredients. We don’t have a standard recipe for anything, but Virginia always wants broccoli in her dish. It has been way too hot for the local broccoli so I was forced to use some from the grocery store. It isn’t like Twin Springs variety, but it was ok. We were able to use the scapes which have kept well in the fridge for the last three weeks. They still taste amazing and the only thing you need to do is trim them a little more than we did when they were just out of the ground. We also switched from the spring onions to Twin Spring’s fantastic red and white onions. I love onions and used four for the dish. The okra and green beans were the real heroes of the dish and both were cooked on the grill. Not only does it keep it cooler in the house, but they get good and crispy on the grill and you don’t have to use as much oil. In the wok on the stove, I combined all the other ingredients from longest cooking to shortest so I can cook and prep vegetables at the same time. Broccoli with stems, onions, firm tofu, red peppers and another first of the season addition, red peppers were put on the highest possible fire with a little grape seed oil. I then added bi-color corn fresh off the cob and quickly added the grilled green beans and okra from outside. 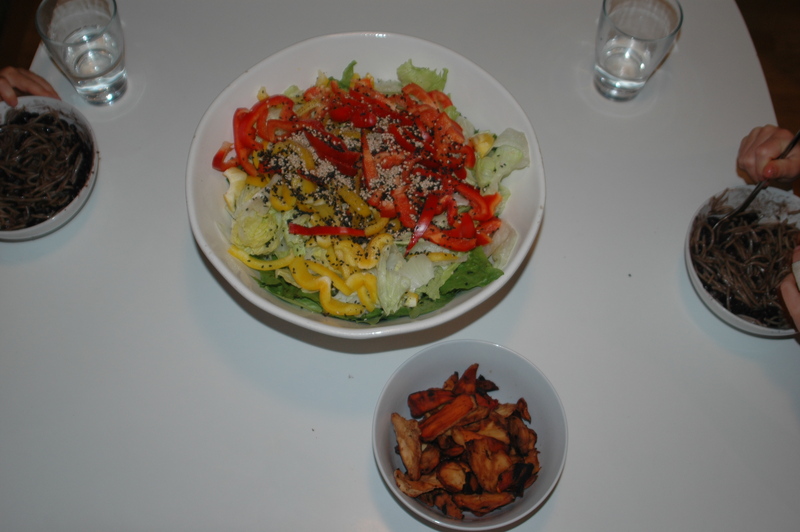 I then mixed in the sauce of sesame oil, gluten free soy sauce, black vinegar and aged Asian black beans. As soon as the sauce was in I turned over the addition of the brown rice noodles to Virginia who usually does this while I run up for a shower. I like to shower before eating in the summer since I get so hot and sweaty cooking over the grill and stove. Not that we dress for dinner, but something about all of us showering before dinner seems civilized to me. We can linger as long as we want over a meal and don’t need to do much to get ready for bed after. 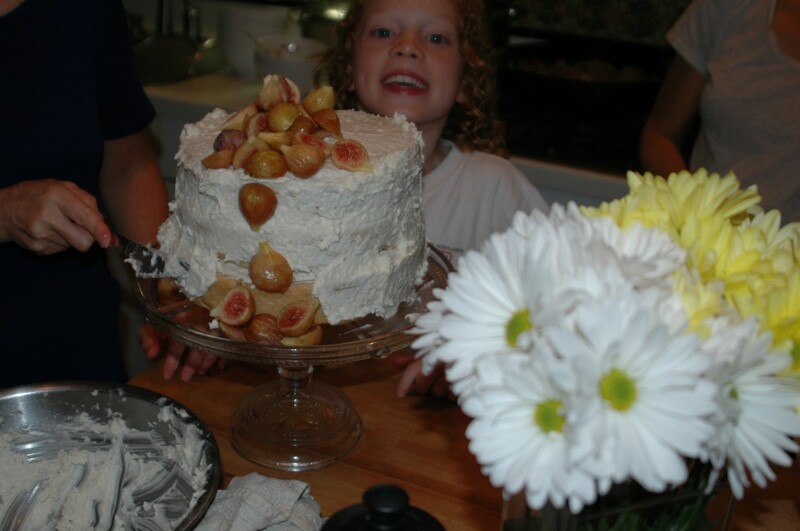 As I was cooking Virginia was making an amazing gluten free vegan cake. It was coconut milk based with a coconut frosting. It was awesome and huge. It really looked like a wedding cake. The late addition of my niece and sister to celebrate Noah’s birthday was awesome. While they live in town we don’t get to see them as much as we would like and the cousins love when they get together. It made the family birthday dinner even more special, and they also brought us the most amazing fresh figs from their downtown DC tree. It made the perfect topping for the cake which we could hardly make a dent in. It was an awesome birthday that we will continue this weekend at the pool with some of Noah’s friends. Noah and I might be the only ones who like eggplant in our house at the moment. Over the last few years Sasha has gone back and forth. Virginia has never really liked it. Sometimes it is ok for her, but she has a texture issue. She never craves it and doesn’t get as excited as Noah and I do at the market. When they are so little and perfect I can’t resist. There is always that moment when I can’t believe that they are not loved by all as much as they are by me and I buy a huge bag of them. I am really lucky because our family for the most part isn’t very particular. Sasha can be a bit of a contrarian and sometimes balks at what we make, but for the most part he is pretty good about eating. I never make him anything different, and I don’t lie to him about ingredients ever. We try to always be honest with them and hope they will return the courtesy down the road. With that said, we are pretty strict about preparing one meal and not offering different dinner options for everyone. 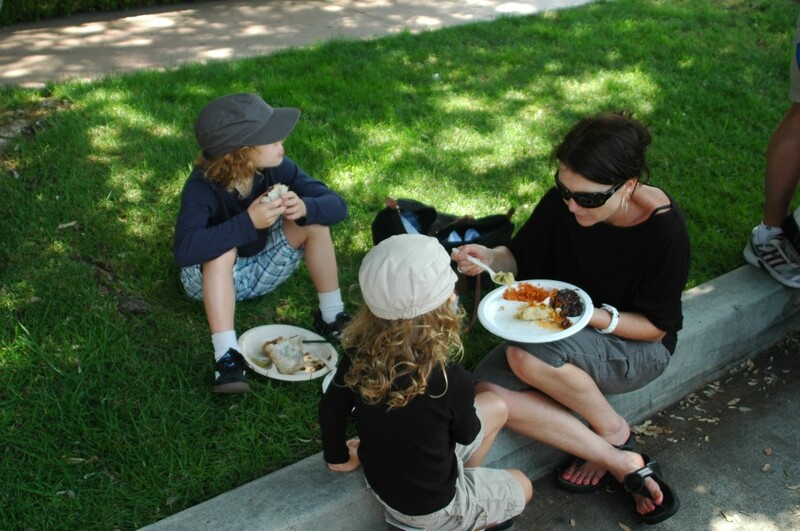 For us, meals are about sharing and experiencing food together. We all sit together until everyone is finished. I will never claim to be an authority on parenting, but it works really well for us and I look more forward to our mealtimes than anything else. I do, however, usually ask what everyone feels like and give some choices with the ingredients we have. 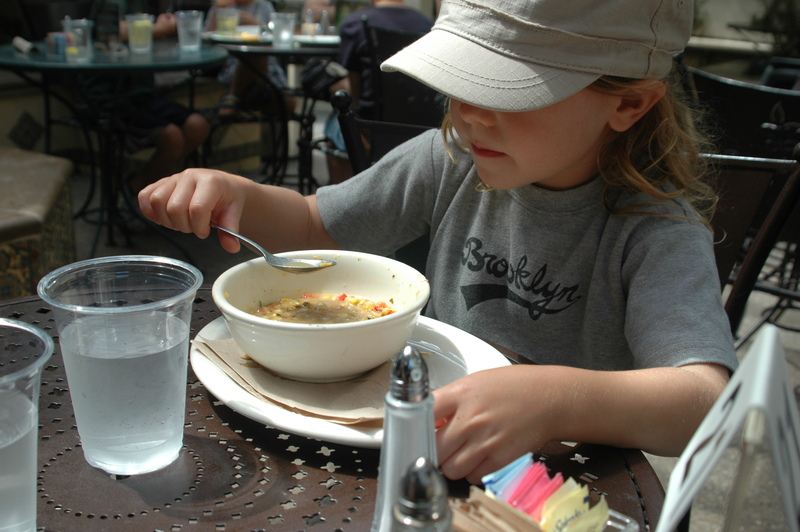 I remember on occasion, in my restaurant, parents would ask us for a kid’s menu or if we could make something special for their children. I never understood why kids should eat any differently than their parents. I am not saying that my kids are perfect and sometimes Sasha has known to be a little difficult, but I don’t see why dinning needs to be a different experience for children. Eating is so important to us and we truly love to eat together. I just can’t imagine having to cook different meals or eat in places that serve food for kids. Don’t go there and you won’t need to go there. As gluten free vegans you really want to do whatever you can to not limit your food choices even more. 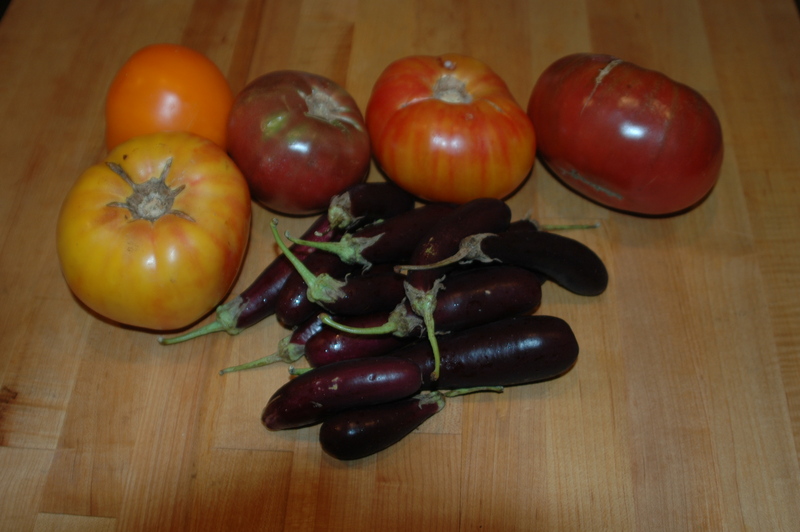 Last night I was feeling game again so when Noah was home from camp with a fever from an infected tick bite, we conspired to give the gorgeous little eggplants a go. 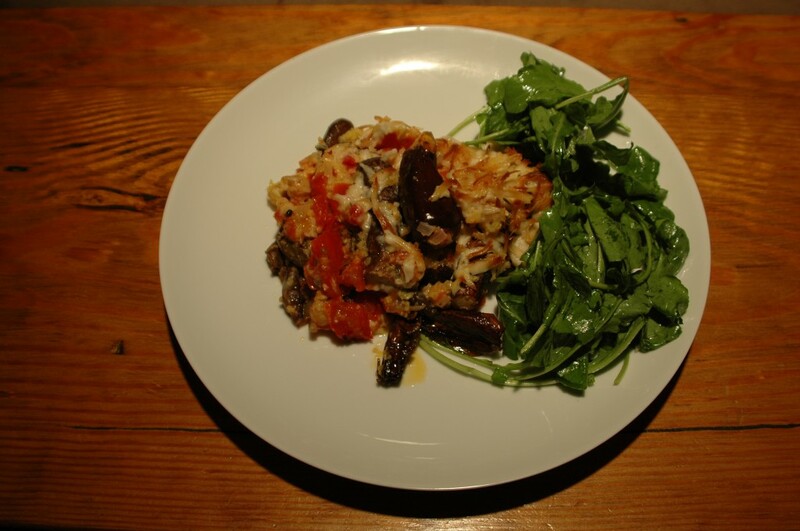 We decided to do our own version of the classic Greek Moussaka. I have written about not using fake products that are highly processed. We never use any faux meats or chicken. I feel like we have so many good options when it comes to cooking vegan that we don’t need to go there. It isn’t a rule, but I truly don’t crave or desire meat so I certainly don’t feel the need to recreate it. I don’t want to preach to anyone and I don’t have a problem at a dinner or a barbeque if someone is cooking or eating meat. We just choose not to. That being said, I like soy cheese on occasion. “Follow Your Heart” brand mozzarella is our favorite and we use it for all our dishes that are Mediterranean based. For Mexican or our version of Mex we use their Monterey Jack. We don’t use a ton of it, but if we do, “Follow Your Heart” is our brand. Every so often I feel compelled to try something else, but it never comes close. For this dish we decided to use the grill again. I know everyone is as tired of hearing me complain about the heat as they are of the heat itself but keeping the heat outside was an essential part of the dish. This dish takes no time to put together, but it does take a while to cook. In a casserole that was my mothers and reminds me of the 80’s, I coated the bottom with olive oil. I then cleaned all the little baby eggplants and covered the bottom of the dish. I added chopped onions, scapes, tomatoes, and chickpeas. Everything came from Twin Springs with the exception of the garbanzo beans. I also added fresh thyme, salt and pepper, and a little medium grind corn flower to the mix and then covered the top with grated mozzarella. It took five minutes to prep and put the veggies together. 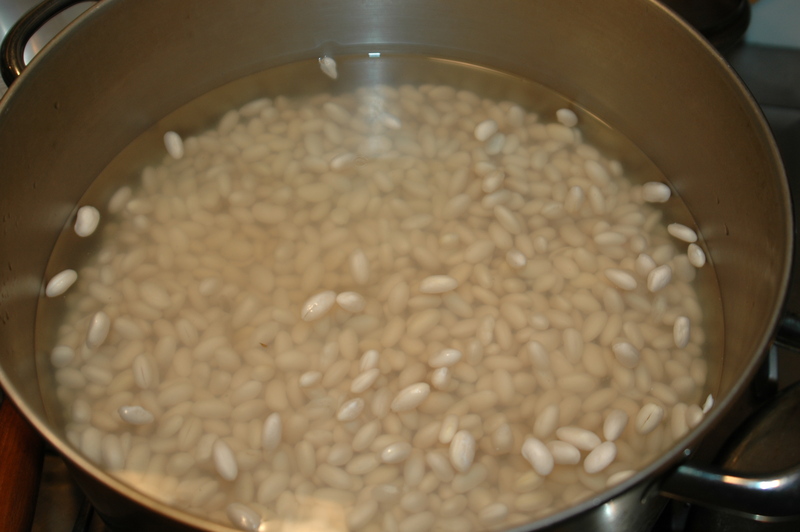 I had soaked the garbanzos the day before, but you can use canned beans if you didn’t plan ahead. I then put it on the grill with a medium flame on all the burners and walked away. It took about 45 minutes to cook and the only checking I did was a slight poke of the eggplants to make sure they were done. The arugula from the market has been amazing so we did a simple salad to go with dish. I love the combination of hot and cold together and the cleanness of the greens makes a great contrast to the dish. So Sasha wasn’t captivated. He tried the eggplant and ate some, but he devoured the rest of the dish and didn’t complain. Virginia loved it and while I always go for a total victory, three out of four ain’t bad. Heat has been a theme for the last few weeks. It is totally insane how freaking hot it is. Still, when the kids wake up the house is cool from the AC and they want a hot breakfast regardless of what the forecast is for the day. 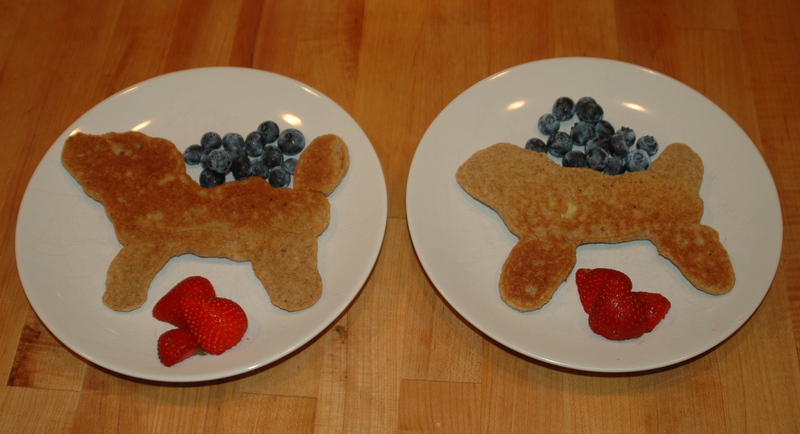 When I was a kid my mother would sometimes make me pancakes that were shaped as funny objects. Usually, however, they were your normal round circles or smaller circles that I called babies. 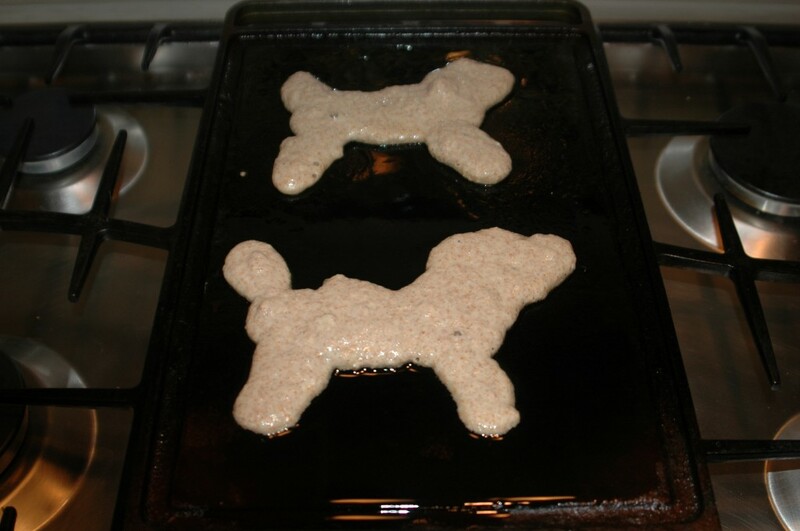 We made the mistake of making alphabet pancakes years ago. We used to do a first initial but shortly thereafter we started making the whole name. Lower case letters are hard to create freehand from batter and it takes some practice. We are getting better, but you need to have the perfect consistency to really make a believable pancake that can also be used as a teaching tool. Somehow recently we have shifted to topical shapes. To combat the heat this morning the kids asked us to recreate ski patrol dogs from Aspen. Our kids are obsessed with skiing and love our dog and all others. Ski Patrols are firefighters x 10. Mix in an avalanche dog and you have one heck of a pancake. We have been really lucky to get to Aspen for a visit every year. When I went to school in Colorado, I was lucky enough to make wonderful friends who were natives of Aspen. I fell in love with the people, the town and the mountain. After college, I was a ski bum in town working multiple jobs and “living the dream”. 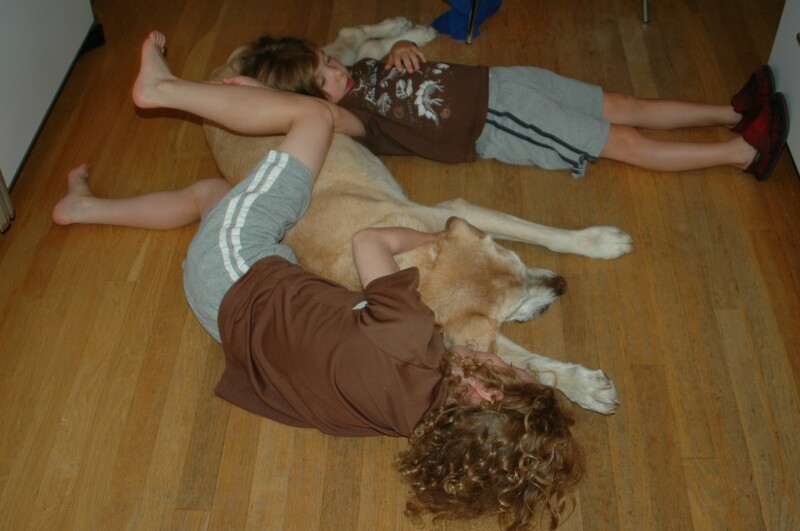 We go to visit our friends every year and Noah and Sasha feel as though it is their second home. While skiing, the kids have had the chance to meet and play with the ski patrol and their avalanche dogs. 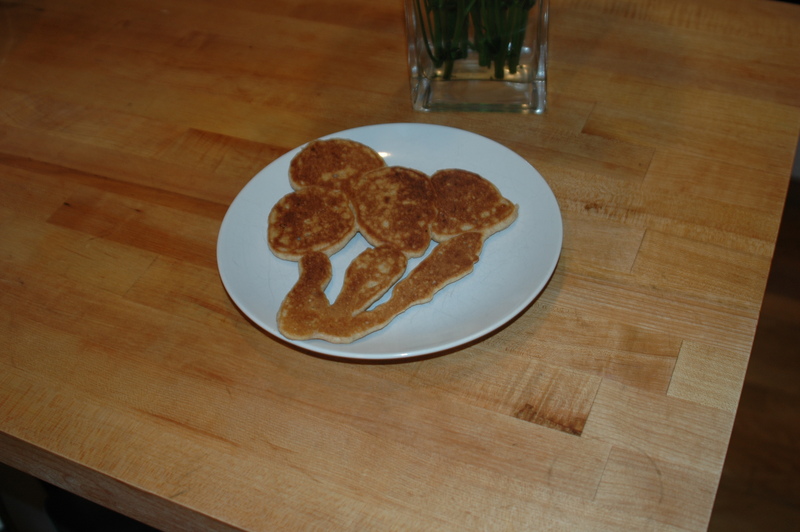 So the vegan pancake is super easy to make and takes very little time. 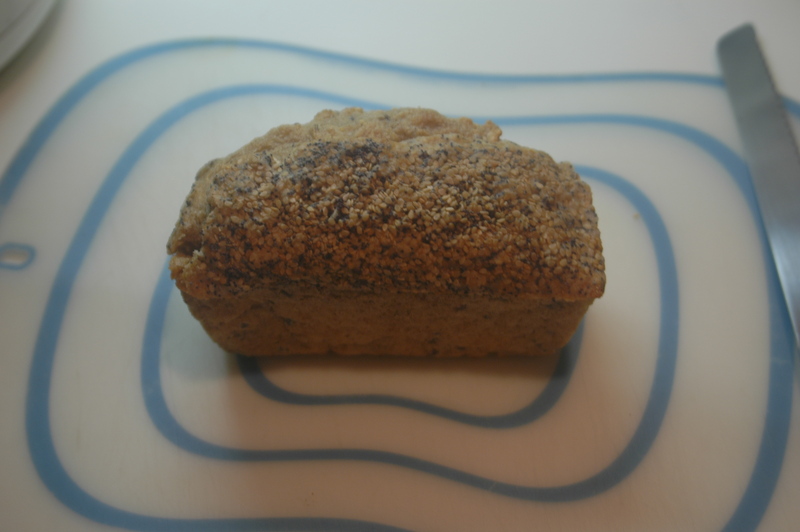 I combine mostly almond flour, whole-wheat flour, oat bran, a soft banana, equal amounts of baking powder and soda and soymilk together. On a hot griddle with grape seed oil we make our shapes. Like all pancakes, we wait for the bubbles to pop and then carefully flip them so as not to loose an arm, head or leg from the pancake shape. This time of year they are amazing with fresh berries from Twin Springs market. The local blueberries are so amazing and with a little maple syrup we got a hot cool breakfast. No disrespect intended. 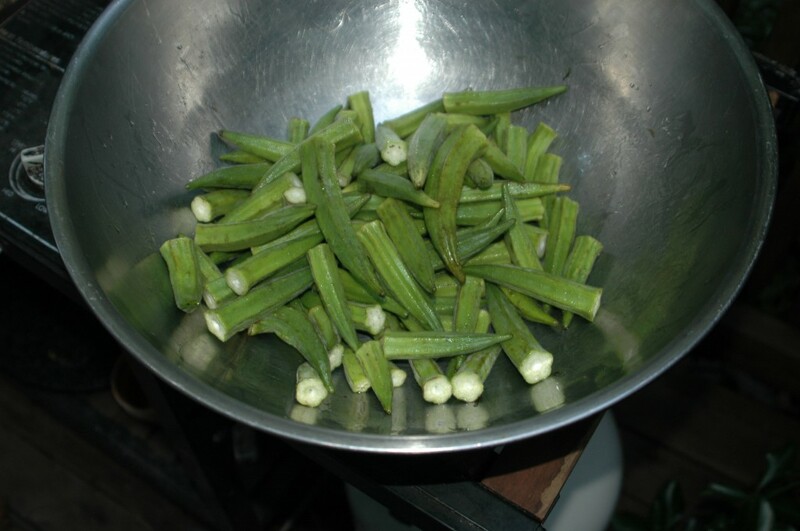 We love okra. 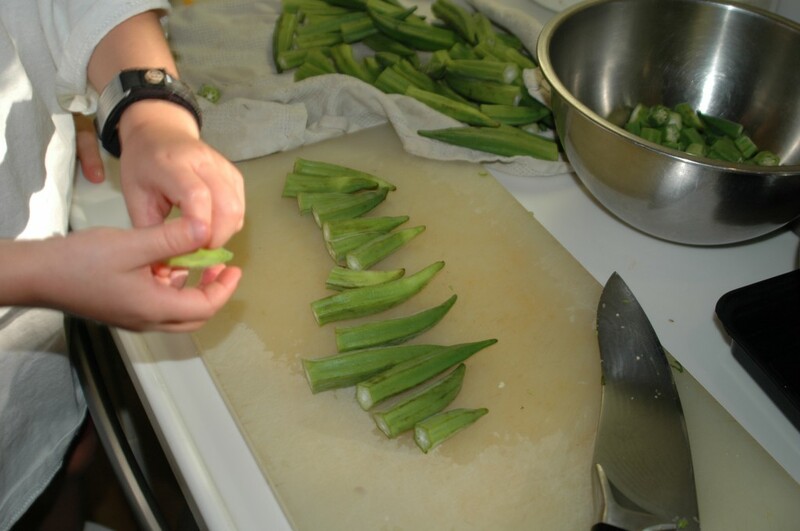 Twin Springs has had the most wonderful okra this past week. Sometimes the big ones can be tough and horsey, but they have been very tender. Mostly we cook okra on the grill. It is really easy and tasty, but we also love it in dishes. 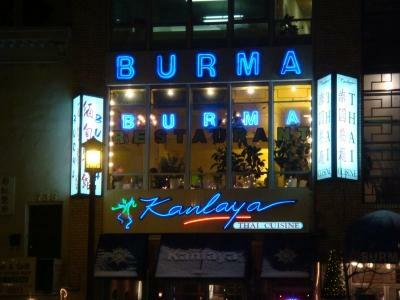 Our favorite restaurant Burma serves a cold okra salad that is always a favorite of ours and somehow one night, as I often do, I renamed the dish adding the first name of a popular talk show host. We love using seasonal vegetables in different types of cuisines when they are fresh and local. Early in the summer we had asparagus for breakfast, lunch, and dinner since we knew the season was short for the local stuff and we would miss them when they were gone. We had them Asian style, Italian, Mexican and no style at all. We try to eat local and in season whenever we can. I know it is better for the world but really the reason that motivates us is that it tastes so much better. I have been known to get asparagus or broccoli from the store out of season. It usually disappoints but we still do it from time to time to satisfy a craving. We don’t have local bananas, artichokes or avocados in the DC area, but they are staples in our house. We would be even more limited as Gluten free vegans if we didn’t import. I also know that big farms or even efficient little ones can have less of a carbon footprint with the shipping than some local ones just down the road. We try and balance. Taste is usually what drives our choices. So much of what was in the house from the last market shop was gone. I needed to go to the local grocery store to get a few organic bananas and avocados. Before I turned off the engine, I noticed that the parking lot temp was 102. It would be another night for the grill. 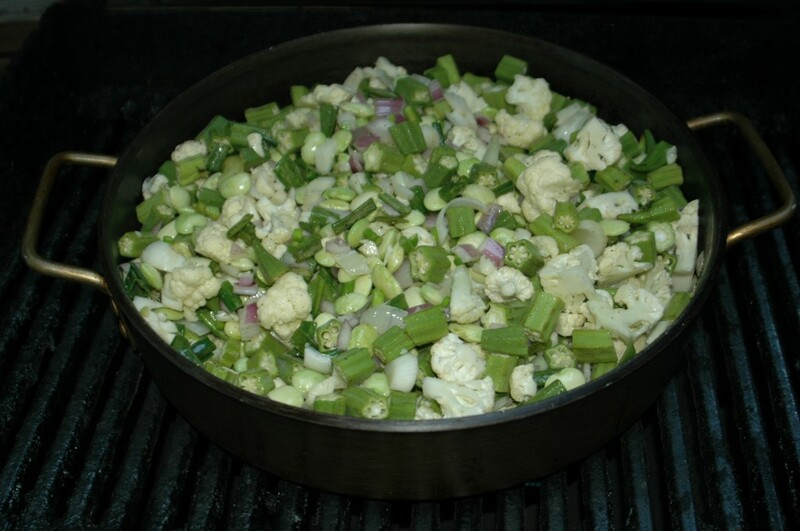 While I was there I saw a lovely organic cauliflower and thought it would be a good mix with the okra and green onions. 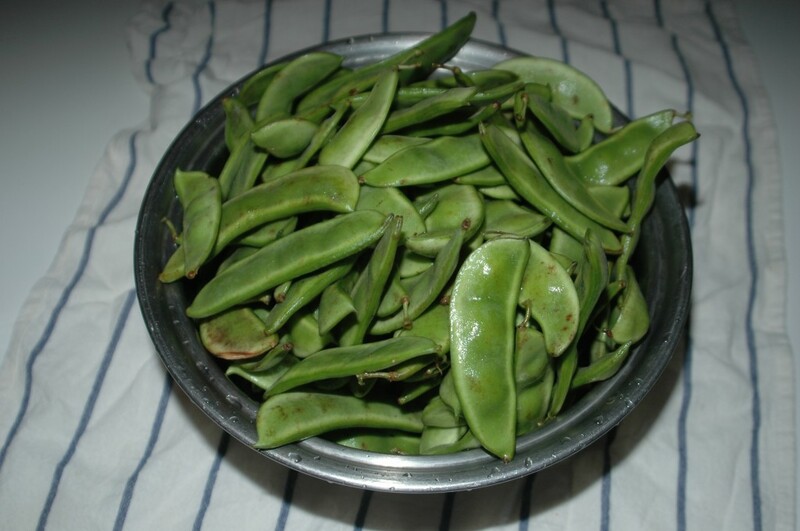 When I came back from the store, Virginia had shelled all the lima beans, which is no easy task. The boys cleaned and lined up the okra on the cutting board. I let them cut with a knife depending on what the veggie is. Okra can be a little tricky and with so many little fingers and little stems, so I did the chopping when I came back. We now had the makings of a really good Jambalaya. I use the term loosely, but the dish would have a New Orleans rice dish feel and taste. In our big pan for the grill, I put the onions, limas, scapes and olive oil. 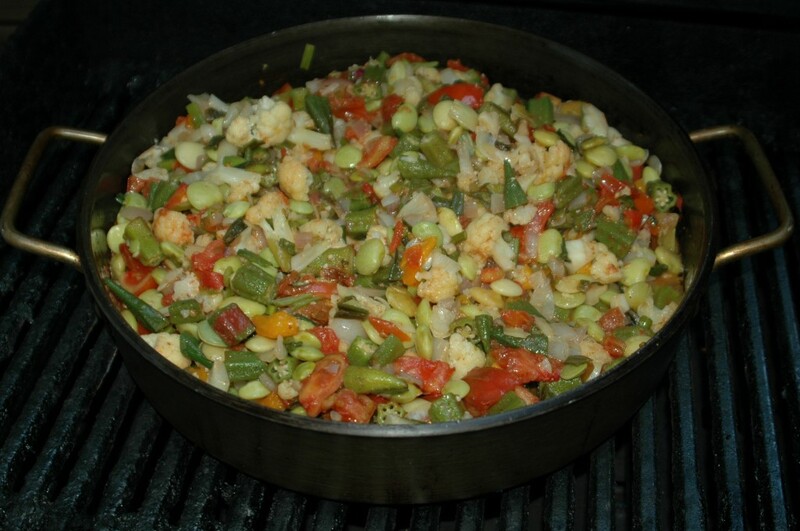 I then cleaned, chopped and added the okra to an already browning mix on the grill. I usually use the highest possible heat and stir regularly. In between mixing, I ran back inside to dice some tomatoes to add to the mix. I always want to get the veggies cooking before I add something like tomatoes so the water doesn’t steam the vegetables. I want a juicy base since I want the rice to soak up the liquid and get it’s flavor without drying out the whole dish. I had the rice cooking in the rice cooker plugged in outside so as not to add to the work of the air conditioning and heat up the house. As much of the cooking process as possible takes place outside when the temps are crazy hot. I also noticed a bottle of Rioja that was leftover from the night before and added it to the mix to give it some more flavor. Red wine in a hot house doesn’t keep very well for drinking, but it is great for cooking. Paprika, salt, pepper and a healthy dash of red pepper from our friends Brooklyn garden rounded out the dish. Virginia then added the rice to the pot as I ran up to take a shower. This dish clearly had a hook for the boys with the okra and tomatoes. Okra Winfrey was back for the season. We have had a week of hellish temperatures. The kind of heat that makes you question why you live where you do. We have friends and family who live all over the world, and whenever we talk during the summer it seems that as though we are the only ones living in swelter. For the first few days of temperatures over 100 degrees, we visited our local pool and found some relief. But as of yesterday, the pool felt more like a hot tub without the therapeutic jets. Everyone in our house prefers winter with the exception of Virginia. Samantha and the boys love the snow and never feel it is too cold. I always argue that you can always put on more clothes. Since Virginia is always cold, thermostats in our house and cars seem to change on their own. For our poor dog Samantha, the heat is really brutal. I have been taking her out on walks before the family gets up to try and beat the heat, but there is no winning. 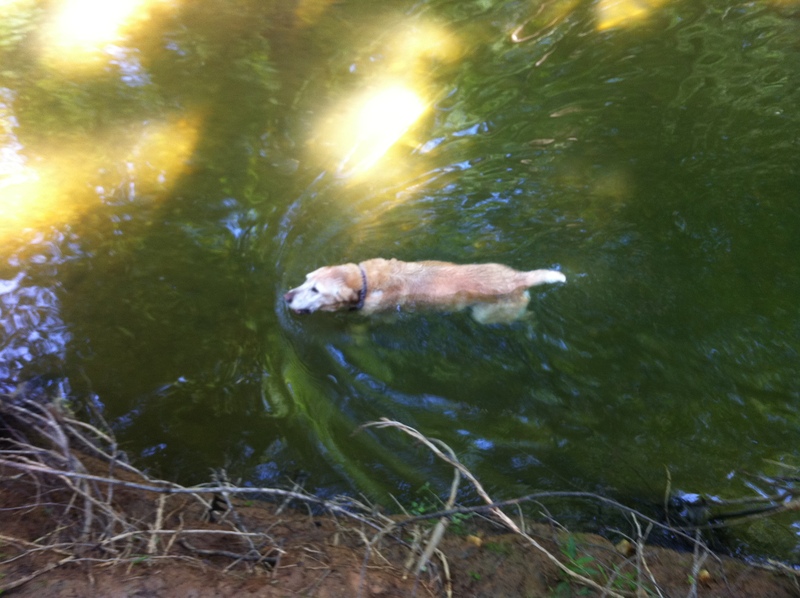 We hose off before we go out, swim in the creek and look forward to coming back into the air-conditioned house. It is hard to imagine cooking in these temps, but everyone still gets hungry and I am the only one satisfied with a cold meal. Everyone else wants a hot multicourse extravaganza every night. So before the heat hit its record breaking, news worthy highs in the DC area, Twin Springs market had some amazing chard. I usually think of this green along with kale as a winter green, but it looked so delicate and tender that I had to get it. The problem was I couldn’t picture using it since we had so much nice summer stuff that we hadn’t seen for months. So when an old friend, who I had met one lucky summer a long time ago while skiing in New Zealand saw my blog, I was inspired to cook some chard. I had never heard of “silverbeet”, but apparently that is what Kiwis call chard and my friend Jacqui seemingly had an abundance of it in her snowy garden. It seemed almost fitting to make a dish that had a winter connection to help try and cool us down. When it is this brutal it is hard to imagine even standing over the grill. I have taken to assembling all the ingredients in a large risotto pan and cooking them on the grill all at once or adding veggies throughout the process. But when it is 100 plus degrees outside standing over the grill is painfully hot as well. So I confess to cooking on the stove with the exhaust fan cranking. I knew that the kitchen might get a little hot, but at least I would not have that disgusting feeling of walking into a hot wall of water when I went back and forth to the grill. So again for us gluten-free, vegan, Volvo driving, overhead fan using, longhaired kids family, we switched gears a bit and let the AC do it’s magic. It felt so civilized and wasteful and good. 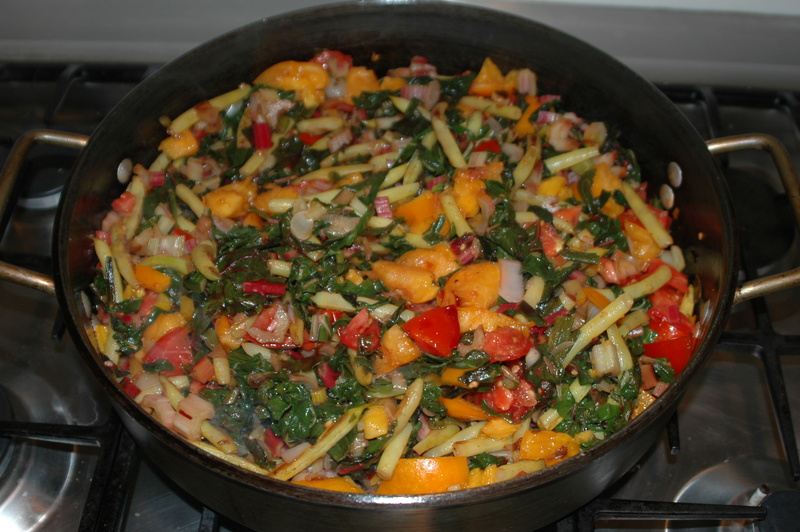 In the pan was our trusty local spring onions, scapes, wonderful wax beans, red and yellow tomatoes and lots of chard. In the spirit of the heat we put everything in at once on the highest possible heat. Salt, pepper, and fresh thyme and sage seasoned the dish along with turmeric, paprika and cumin. I also added a splash of Red Burgundy from the night before since red wine in a hot house doesn’t taste so good the next day, but it adds a richness to the dish when cooked. 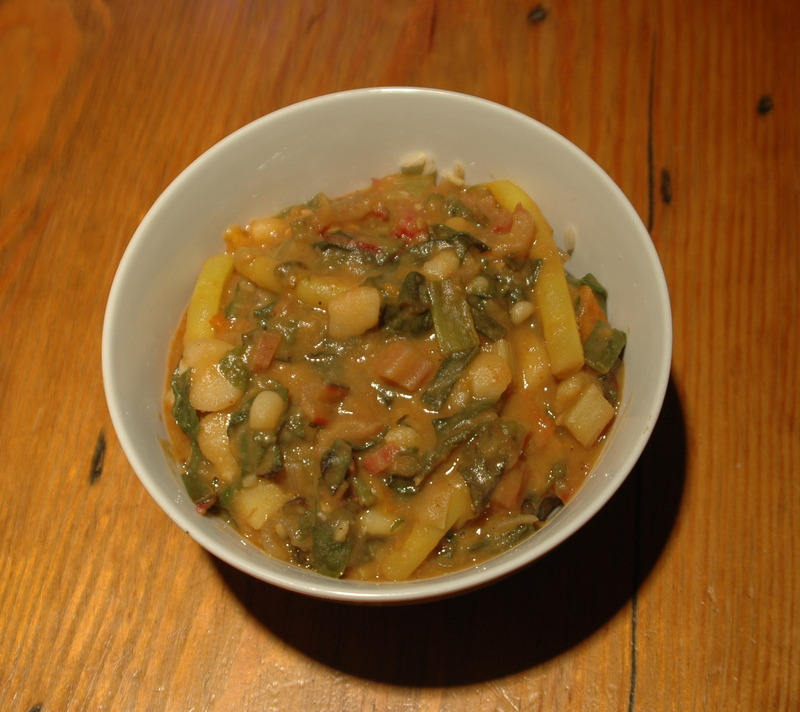 When the veggies were all done, I added a huge helping of fava beans that I had prepared the week before. Virginia wanted favas and I had missed them at the market so I reconstituted dry ones by cooking with water, salt and pepper. While they lost their shape and were a Bessara like consistency, they added a creaminess as well as a protein to the dish. The favas were cooked before, but everything else only took about 20 minutes from prep to bowl and we had Moroccan Tagine with summer veggies. With it I opened a lovely Sauvignon Blanc from Goldwater located on Waike Island off the cost of Auckland that I had visited years ago while coming home from a summer ski trip. It was hot outside, but we were cool, comfortable and full…again.